One day I was looking for new subjects and while browsing my notes I then took a look across the back of our building and then I realised that there was so much happening around us that I might even probably uncover a few dozen subjects in themselves just looking at the buildings around me, the people behind windows, some dressed, some not, having a cup of coffee in the kitchen or watching the TV or even just having a stroll between four walls and possibly talking to themselves in the privacy of their apartments. For those wondering where St Jacques in Paris is, here’s a map courtesy of Google. 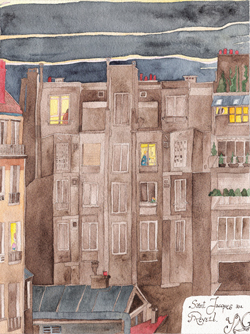 That’s how I got started on the St Jacques series, a collection of drawings and watercolours showing the buildings around the area, and catching glimpses of the lives that are unfolding before our very eyes at various moments of the day. 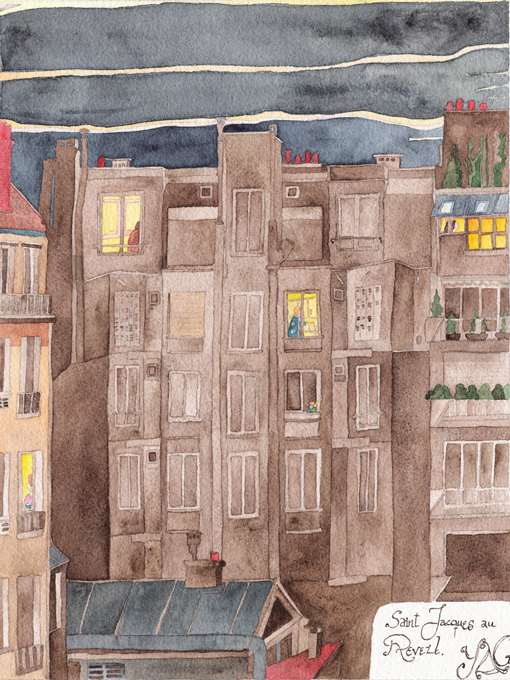 My number 1 watercolour of Saint Jacques was dedicated to mornings, a minute description of what was going on at day-break with people having breaksfast, walking around in their bathrobes or even working from home as I do so often myself. 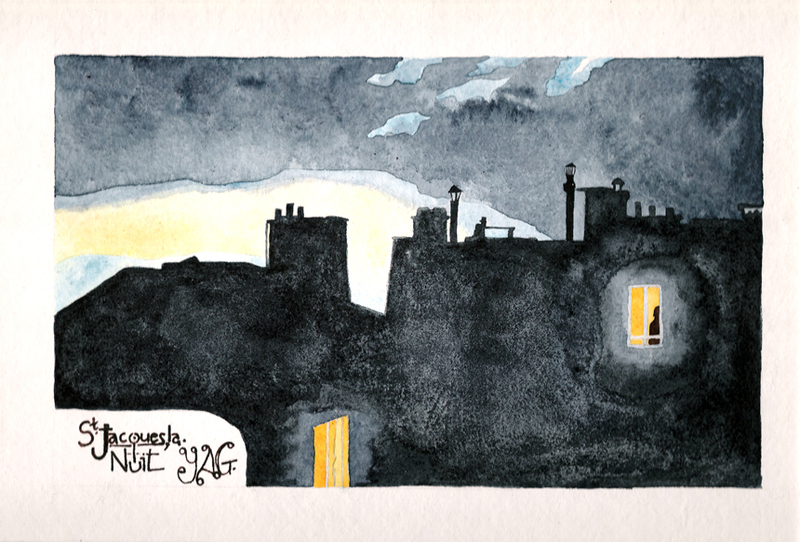 Number 2 is about the same area at night, only from a different angle and with a different size, a picture in which only a few brightly lit windows are emerging from a huge dark mass of concrete and stone walls, the textures of which at that time of night cannot even be perceived anymore. Number 3 is a triptych version of an evening in Saint Jacques, not yet so dark as the night one but quite dark though. As it happens, I finalised evening number 2 even before evening number 1 had been started so expect the original to appear later on this blog after its sequel.